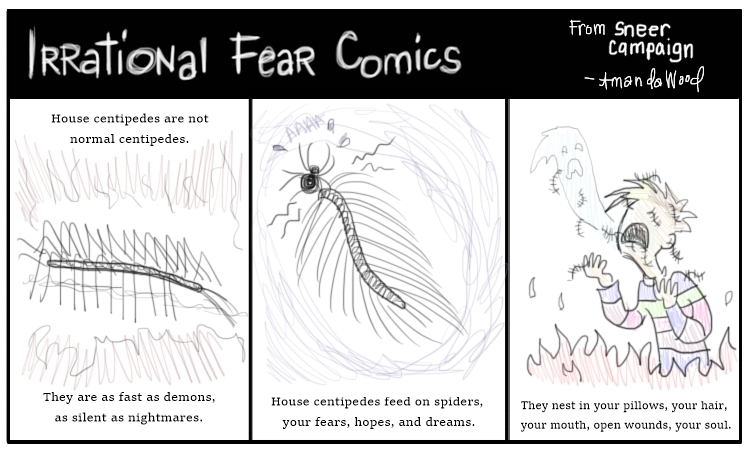 On October 20th of the year 2016, I made this comic and accompanying short article about my irrational fear of the common house centipede. I wrote about it and then shivered and flailed for a while, because even the thought of them is enough to send me into fits of terror. Well, last night as I was on my way to a shower, I nearly stepped on one. I know I should have given you some warning, but it should have given ME warning. It was already dead, that’s why any of this happened, but basically my toes thought I was about to fully step onto a bramble or errant piece of steel wool, so I moved at the last moment, turned on the light, and was met with my worst nightmare. I TOUCHED A HOUSE CENTIPEDE and I will never forget the feeling. R.I.P., left foot. You were a good foot. I had a good life. However, I think it is important to take away a positive message from my hugely traumatic ordeal that did not result in hours of flailing. As I sat in my room, with the bathroom door closed for the rest of all eternity I thought, I was surprised by how calm I was being. 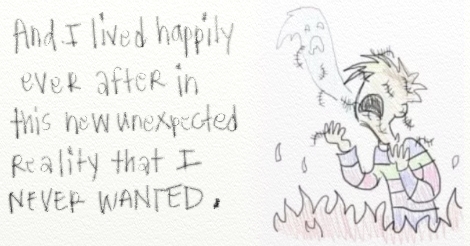 Sure, I scraped my foot on the carpet in order to scrape away the memories, and maybe also the skin because it was now cursed, but I didn’t die on the spot like I always thought would happen. And even though I thought I would have to calmly burn the entire house down and then drown myself in the river — I didn’t do that either. After dramatically speaking of the moment on Facebook and crying all over an unsympathetic cchris in a chat, I got the vacuum cleaner and disposed of the corpse for only five minutes instead of a thousand years. I am a survivor. And now if I encounter aliens, Mirror Amanda, a shark in my bathtub, or unexpected realities behind closed doors, I feel like I might be able to endure them in a somewhat sane manner.